The Jack Russell Terrier derives its name from the Reverend John Russell, a fox hunter from mid-nineteenth century England who bred terriers to produce a dog which could run as fast as a horse and catch and kill a fox. He was very successful, and his breed became popular with a number of enthusiasts almost immediately. It was more popular as a working dog than a show dog because it is first and foremost a hunting dog. However, Jack Russell Terriers are shown and do well, especially in field trials. The Jack Russell Terrier measures between 10”-15” at it's withers. It has a flat skull, small eyes, small, V-shaped ears pointed toward the face, and powerful teeth which form a level or scissors bite (scissors preferable). The Jack Russell Terrier has a flat back, high, happy tail which is docked, and small, round ‘cat feet’. Forelegs should be straight and strong; crooked legs may be an indication of Achondroplasia. Working Terriers (‘Jack Russell Terriers’) should have chests less than 14 in at their widest. The Jack Russell Terrier is taller than it is long. There are three different types of Jack Russell Terrier coat. The smooth-haired Jack Russell Terrier has thick, smooth hair, about a centimeter in length, over its entire body. The rough-haired Jack Russell Terrier has a double coat up to 10 cm in length over its entire body. The broken coated Jack Russell Terrier is a mix of the two. All coats are dense and coarse. Jack Russell Terriers are more than half white with tan, black, lemon, or tricolor markings. Markings are preferably restricted to the head and base of the tail. The Jack Russell Terrier is brave (sometimes excessively so), boisterous, observant, happy and self-confident. Owning a Jack Russell Terrier requires an ample supply of patience; they are great matches for exuberant owners who are prepared to entertain and exercise them, but are not for everyone. Jack Russell Terriers are loving and gentle with their owners. But they will defend themselves against mishandling, even if they are being mishandled by a small child. The Jack Russell Terrier is brave (sometimes excessively so), boisterous, observant, happy and self-confident. Owning a Jack Russell Terrier requires an ample supply of patience; they are great matches for exuberant owners who are prepared to entertain and exercise them, but are not for everyone. Jack Russell Terriers are loving and gentle with their owners. But they will defend themselves against mishandling, even if they are being mishandled by a small child. The Jack Russell Terrier can be aggressive with other dogs and should be socialized when young if possible. It is however, still a hunting dog, so don't expect it to cuddle up with your gerbil or guinea pig. It's natural hunting instinct will kick in and could result in the chasing of the family cat. It may try to be dominant over other dogs, regardless of size. Jack Russell Terriers are fearless. Visitors will always be announced with a distinctive bark. You can find Jack Russell Terrier puppies priced from $150 USD to $2000 USD with one of our credible breeders. Browse through our breeder's listings and find your perfect puppy at the perfect price. The Jack Russell Terrier can be aggressive with other dogs and should be socialized when young if possible. It is however, still a hunting dog, so don't expect it to cuddle up with your gerbil or guinea pig. It's natural hunting instinct will kick in and could result in the chasing of the family cat. It may try to be dominant over other dogs, regardless of size. Jack Russell Terriers are fearless. Visitors will always be announced with a distinctive bark. All three Jack Russell Terrier coat types are relatively low maintenance. Jack Russell Terriers should be brushed with a rubber brush when shedding to remove dead hairs. Occasionally, the coat of the rough-haired variety will need to be plucked. 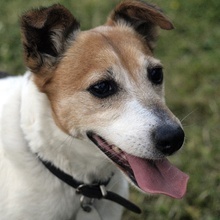 Jack Russell Terriers are known for their good health and long life span of 15 or even 20 years. Puppies should be tested for deafness. The Jack Russell Terrier learns quickly but will always try to have its own way. Consistency in training is key. It will try to win you over with its mischievous charm, but do not be fooled! Jack Russell Terriers are able to learn a variety of games and excel in events such as dog agility and Earthdog competitions. They require firm and consistent handling. The Jack Russell Terrier is an intelligent and bold dog. The Jack Russell Terrier has a seemingly inexhaustible supply of energy. It must be given many opportunities to burn it off. Jack Russell Terriers need to run and play, and enjoy agility skills and playing catch. Digging, barking, and staging escapes are their way of telling you they need more exercise. Jack Russell Terriers are happiest on a farm or a home with a large backyard where they can frolic, and will not enjoy life in an apartment. Their hunting instinct is strong and they need to be monitored if off-leash and out of their yard as Jack Russell's have been known to go to ground after a quarry and stay to ground for days. Jack Russell Terrier Puppies for Sale - Shipped Worldwide! Finding the right Jack Russell Terrier puppy can be dog gone hard work. PuppyFind® provides a convenient and efficient means of selecting and purchasing the perfect Jack Russell Terrier puppy (or Jack Russell Terrier puppies) from the comfort of your home, 24 hours a day, 7 days a week. Take advantage of our PuppySearch or leisurely browse our directory of hundreds of dog breeds, Jack Russell Terrier dog breeders, Jack Russell Terrier dogs for adoption, and Jack Russell Terrier puppy for sale listings with photos and detailed descriptions. Some Jack Russell Terrier puppies for sale may be shipped Worldwide and include crate and veterinarian checkup. Many Jack Russell Terrier dog breeders with puppies for sale also offer a health guarantee. With thousands of Jack Russell Terrier puppies for sale and hundreds of Jack Russell Terrier dog breeders, you're sure to find the perfect Jack Russell Terrier puppy.